Opening hours: The Stadtpark is accessible around the clock and has no closing times. Tip: The golden plated bronze statue of the former Viennese waltz king Johann Strauss son is an unique photo scene for impressive pictures. The Stadtpark Vienna (D1/D2/E1/E2) with the size of approx. 65.000 m² is since the year 1862 the biggest park area in the center of the city and it is equally well liked by the tourists and the Viennese citizens. Especially guests of the hotels at the Parkring can enjoy the nice view and are only a few meters away from a relaxing walk through this green area. 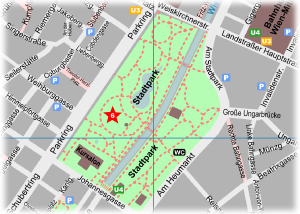 The recreation space which was designed in an English landscape style is located between the Parkring in the 1st district and the Heumarkt in the 3rd district. The river Wienfluss splits the Stadtpark in two parts and bridge constructions like the iron Karolinenbrücke connect those both parts. Worth mentioning is also the info about the planning of this park area. The landscape painter Joseph Sellény provided the template and the city gardener Rudolph Siebeck made the planting accordingly. Winded paths with numerous benches lead through this city park in Vienna passing by several pools and fountain installations. At the picturesque embedded grass area you can find already in the early spring time some people at their picnic enjoying the first warming sun rays, well protected by the surrounding plantings from the noise of the near Ringstrasse. Due to the diversity of the plants you can find nearly the whole year some of them blossoming. A few of them are even protected due to nature conservation (e.g. pyramid cottonwood and Gingko). The Viennese city gardeners are responsible for the gardening masterpiece. They are located at the border of the Stadtpark in a late art nouveau styled building. (Stadtgartendirektion, Am Heumarkt 2B, corner Johannesgasse, 3rd district). For a coffee break you can choose the terrace of the Kursalon (April to beginning of September from 11:00 o'clock). This Italian Renaissance styled building was constructed in the year 1867 by Johann Garben and today it is also used for balls and Clubbings. It is located near to the corner of Parkring - Johannesgasse. The -Meierei- is a villa-like building at the river Wienfluss and was opened in 1903 as a milk drinking hall. Today you can find there the restaurant Steirereck with one of the best gourmet foods in Vienna. 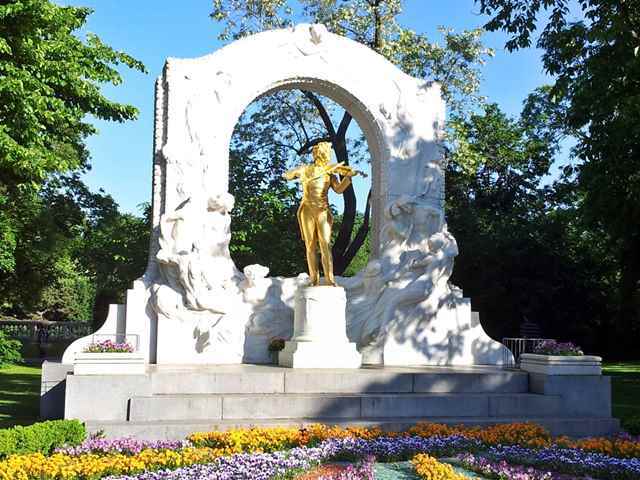 Besides culinary delights you can find also cultural possessions in the city park by numerous monuments such as the ones of the famous composers Franz Lehar and Franz Schubert as well as Anton Bruckner, Robert Stolz and Sebastian Kneipp. The favorite photo subject is without doubt the golden plated bronze statue of Johann Strauss son the Viennese waltz king.